From a wedding photographer's perspective, a couple's special day is the perfect. After all, a few decades down the road, the bride and groom will remember their wedding day through the professional photographer's work. That is why our job is so important. Some say photography is a lie and I don't disagree with that. I would say a professional photographer job is to create a beautiful story of the big day regardless of the conditions under which he operates. As a Toronto wedding photographer I have a lot of stories to tell, and not all of them are fun. However the wedding day images reflected beautiful atmosphere, love, romance and great energy. Often, the bride and groom are under a lot of pressure from families and guests. Other times, members of the wedding party undergo dramas but as they say, the show must go on. Despite the will such moments, wedding photography is about documenting beautiful memories that will stand the test of time. For example once the couple was feeling nervous because the mother of the groom wanted to leave the wedding reception because it was not what she envisioned. Of course, the professional photographer will not focus on that, but rather find moments of love between the bride and groom and capture those. All to the 30,000 weddings that take place every year in the Greater Toronto Area, it is impossible that all of them go well. However, the wedding album will show just those perfect moments because photography has the privilege of distorting reality according to the photographers vision. It is my duty and privilege to document the couple's special day is a perfect succession of moments in time. As such, I will not worry about the GTA traffic, the videographer jumped in my shots or the freezing weather. The bride and groom, and more important, the next generations have to see the perfect wedding day from the bride's preparation, through the ceremony, photo shoot and reception. As they say, a picture is worth 1000 words and there are many thousands that can describe the story of the big day and a particular photograph. This particular photograph of the Liberty Grand wedding album has a beautiful love story behind it. The groom is coming from a traditional Italian family and met his bride a few years ago. The bride the sense for very proud Jordanian family and honestly the wedding day was a blast. The couple is well-versed in beautiful imagery as the bride is a graphic designer in the groom is an architect. Interestingly enough, the groom was passionate about wedding photography and even applied to University of Toronto photography program but sadly he was not accepted. 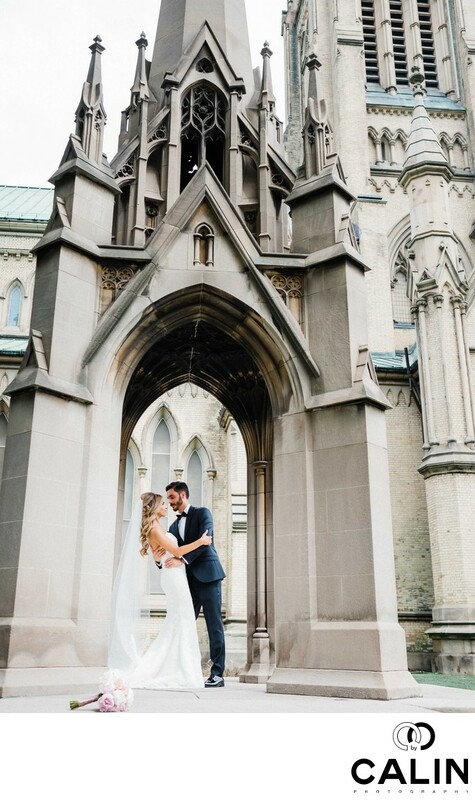 After a romantic relationship that lasted a few years, the couple decided to get married and picked Liberty Grand in downtown Toronto as their wedding venue. While walking hand-in-hand on the lake Ontario beaches the with often look towards the venue and imagine how their wedding with look like. Truth be told, their big day was everything they imagine and more. Almost 200 guests joined them for the outdoor ceremony in the venue's triangular courtyard. The food was delicious and during the cocktail hour we managed to take some photographs in front of the magnificent wooden doors of the building. I also love the evidence of the arched windows and use them as a framing device for bride and groom portraits. To give this photograph a beautiful photojournalistic feel, I directed the bride and groom and then stepped aside and captured the moments. To create this particular photograph I used a 23 mm prime lens mounted on a Fuji XT2 camera. The Fuji 23 mm then it is my perfect tool to capture environmental portraits of the couple on their special day. I see many professional photographers who she's very tight using only telephone lenses and that's unfortunate, especially when the bride and groom spend a lot of money on the decor, venue and so on. In my opinion, it is our job to show the beautiful architecture of the that venue and to offer a variety of looks by shooting, medium and wide frames.